via RabbleLDN, also see – “Schedule 7″ – Important Advice for Anarchists Travelling To/From the UK. Today at Stansted Airport, plainclothes police officers pulled aside a travelling anarchist (Tim from Bristol) and seemingly sought to coerce him into becoming an informant with a combination of intimidation, veiled threats, and offers of free alcohol. But when he started recording the officers on his mp3 player they quickly terminated the exchange and made a sharp exit. At dawn on October 29, 2015, anonymous hands placed an explosive device in the 12° Comisaria de San Miguel. The device consisted of a fire extinguisher filled with black powder and it would have been placed around 2am. The bomb was placed near the intersections of Gran Avenida with Alvarez Toledo, close to the court of appeals in San Miguel and the Fiscalía Sur [Prosecutors of the Southern district], precisely at the gate of the police barracks. Police bastards who were on duty at the police station noticed a suspicious bag in the police station perimeter, activating all security protocol. 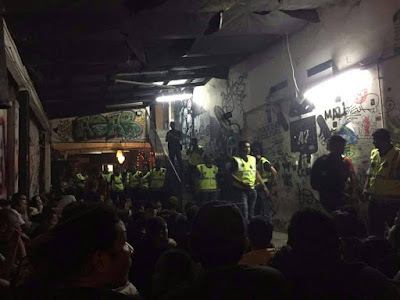 On 28th August (Friday), over a dozen police with automatic weapons and K-9 unit attacked Rumah Api (social center/house project in Kuala Lumpur) during a concert on that night. The police raided the house project and raid everybody during the concert and also trashed the living space of people who live there without any warrant or solid reason for the raid. We all believe the raid were conducted due to the connection of Bersih 4 Rally which happen on the next days (29 and 30th) which is totally insane since the organizer of the concert, participants, and Rumah Api have little interest to join or even support the rally, due to our political stance on the issue of election and voting system. Police in the UK are allowed to question anyone entering/leaving the country about “terrorism” – without the right to silence. We have spoken to a number of anarchists who have been questioned under these powers, known as “Schedule 7″. Because of a lack of information on the law, most of those stopped have given more information than they had to. This includes people from outside of the UK who have not even heard of “Schedule 7″ before. For this reason, we strongly recommend any anarchists travelling to/from the UK read our briefing beforehand – http://bristolabc.wordpress.com/defendant-solidarity/resources-and-advice/schedule-7/. 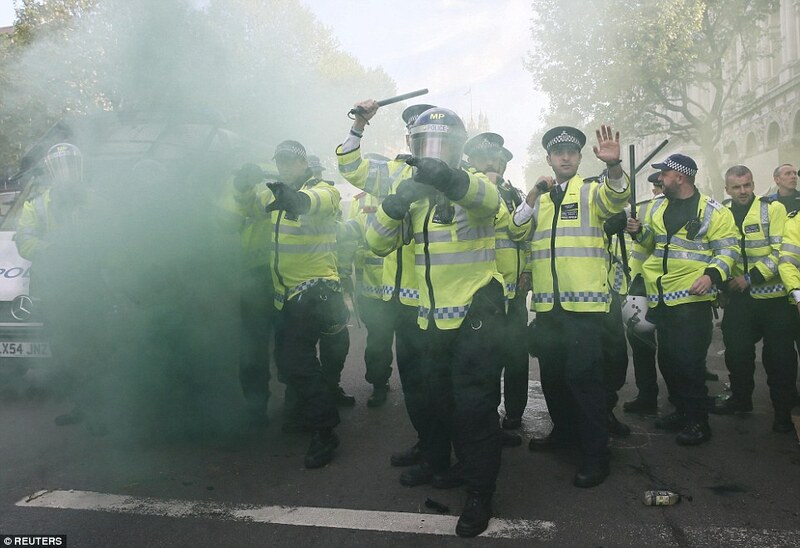 Thousands of protesters laid siege to Downing Street and marched on the Conservatives’ campaign HQ and Parliament, causing havoc which ranged across central London in a disruptive demo which saw at least 17 people arrested and a number of police injured in clashes. A small black bloc was active on the frontlines attacking police and defending the demo from police attacks. Eventually the demo was kettled and the crowd processed. 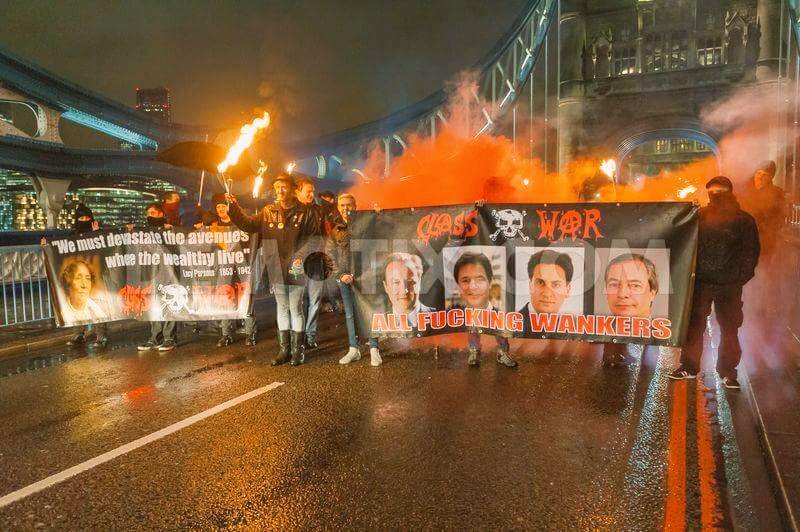 There was a simultaneous event in Cardiff, Wales, and an anti-fascist demo in Walthamstow against the English Defence League, fascist-nationalist group. A spontaneous demonstration against police violence took place in Warsaw, Poland, on 19th of March. Protest was direct reaction to events that took place few days earlier in Legionowo, Warsaw suburb: police organised hunt for marihuana users. During the arrest, one of the detainees was basically suffocated by a cop, who was trying to stop him from swallowing a bag of pot. It has been over five years since we learned that Mark “Marco” Jacobs was not just another anarchist in the south Wales activist scene, but was actually an undercover police officer. Since then a number of people who were directly effected by his use of sexual relations as an infiltration tactic have taken legal action to attempt to hold the system to account.